We love to make easy desserts from scratch. 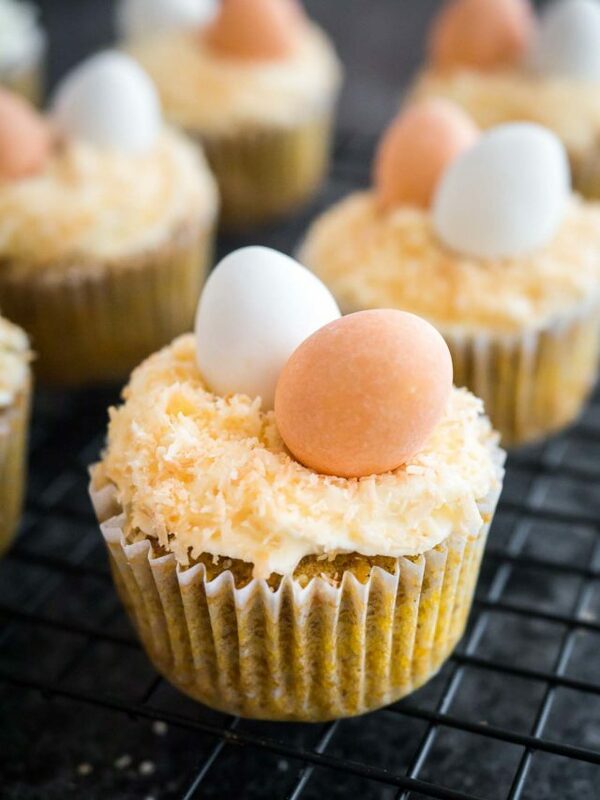 For spring and Easter, we especially enjoy our Carrot Pineapple Cake, Easy Carrot Cake Recipe, and Easter Sugar Cookies. These are the ultimate carrot cake cupcakes and a perfect holiday dessert! 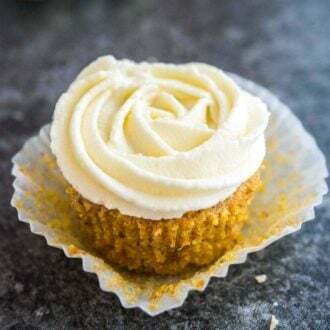 Simple and moist carrot cupcakes with a not-too-sweet cream cheese frosting that goes so well with the spiced cupcakes. 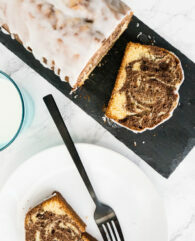 This recipe makes a great addition to your Easter Brunch but also makes a great spring dessert. 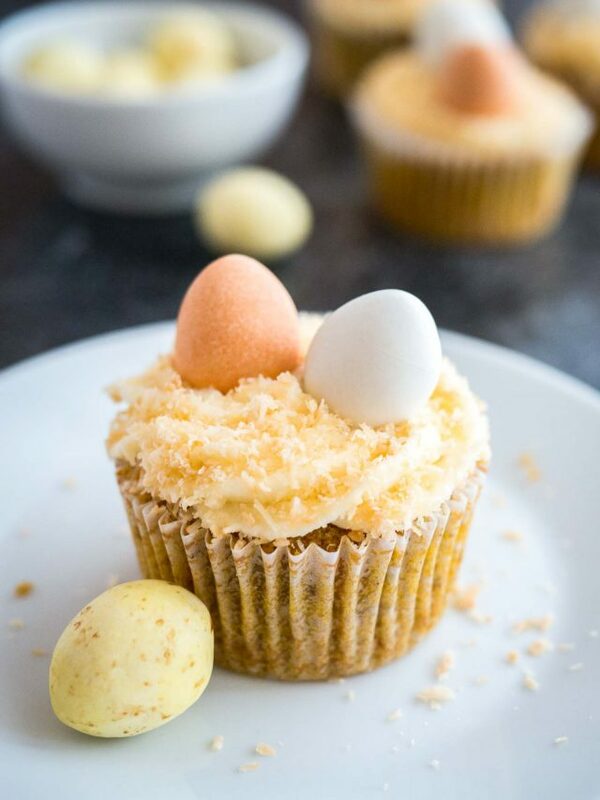 Give these Carrot Cake Cupcakes an Easter upgrade by sprinkling the tops with toasted coconut to make little Easter nests and adding little chocolate eggs. A cute addition to every Easter table! Start with grating the carrots in a food processor or using a grater. Then cream the sugars and the butter together. I use mostly brown sugar in this recipes because it adds flavor and moistness which is essential for a good carrot cake in my opinion. Add the eggs, grated carrots, and unsweetened applesauce. Mix in the dry ingredients, pour the batter into your muffin pan and bake. When the cupcakes are completely cooled make the frosting. Use a food processor to grate the carrots, then pulse them a few times until they are finely shredded. The ground almonds add flavor and moisture! You can make ground almonds in the food processor or use almond flour. The easiest way to get same sized cupcakes is to use an ice cream scoop with a release button to divide the batter into the muffin tin. I prefer to use paper liner to prevent the cupcakes from sticking, this also makes clean up easier. But you can also grease your cupcake tin. These cupcakes are done when a toothpick comes out clean. Let the cupcakes cool completely before decorating them with frosting! The frosting recipe will decorate 12 cupcakes if you use as much frosting as seen in the photos. If you plan to pipe more on the cupcakes double the frosting recipe. Use brick-style cream cheese for the frosting. Not cream cheese spread. Carrot Cake Cupcakes need to be baked for about 20 minutes or until a toothpick inserted in the center comes out clean with only a few moist crumbs attached. These cupcakes should be stored in an airtight container in the fridge because of the cream cheese frosting. Bring the cupcakes to room temperature before serving, or they may be mistaken for stale when they’re actually just cold.
. Start in the center, then slowly move your tip in a circle around the center point. So easy! To make mini carrot cake cupcakes use a mini muffin pan and bake them for 10-13 minutes until a toothpick inserted in the center comes out clean. Grease the pan and fill the muffins cups about two-thirds full. This recipe makes 36 mini cupcakes. 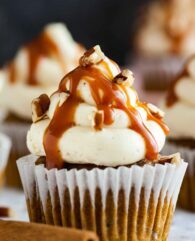 WANT TO TRY THIS CARROT CUPCAKE RECIPE? 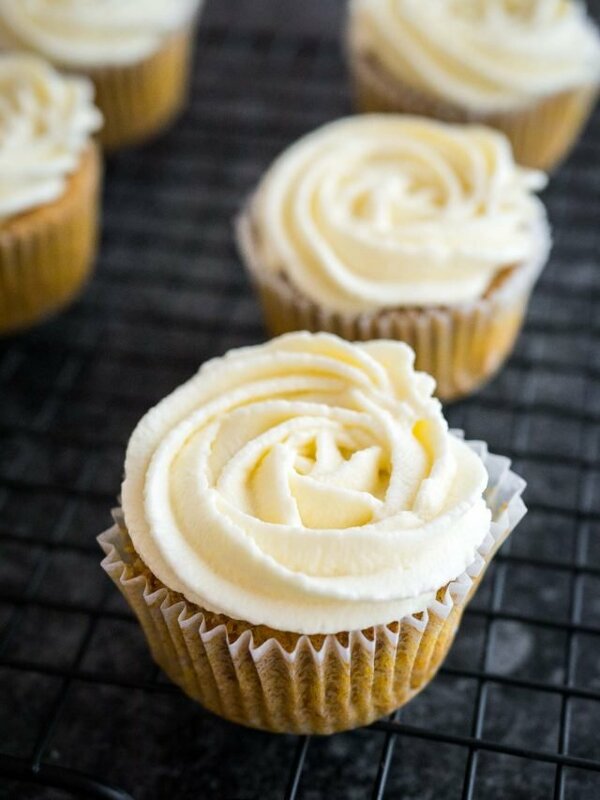 The best Carrot Cake Cupcakes with a not-too-sweet cream cheese frosting on top! 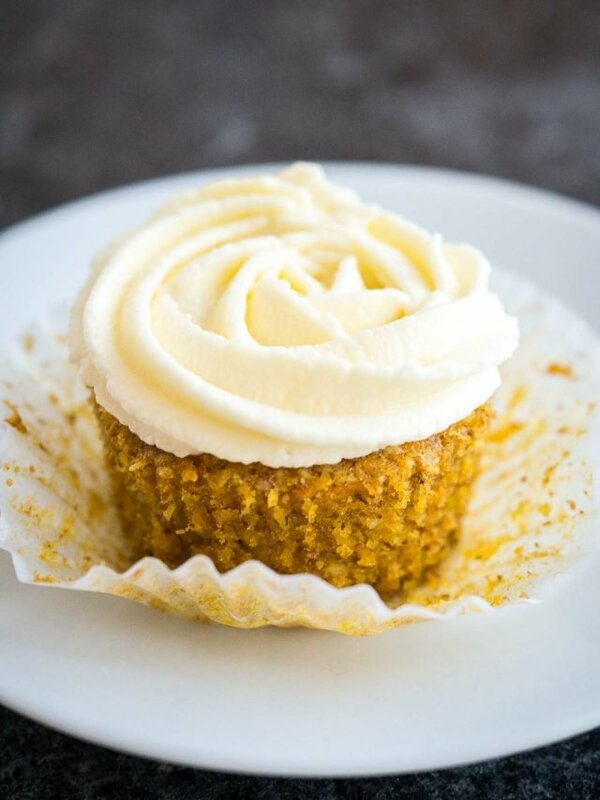 These carrot cupcakes are perfectly moist, lightly spiced and so flavorful. Preheat oven to 350°F (180°C). Line a 12-count muffin pan with paper liners. In the bowl of a stand mixer fitted with the paddle attachment, cream butter, brown sugar, and granulated sugar together until slightly pale and fluffy, about 3-4 minutes. Add eggs, finely grated carrots, and vegetable oil. Mix until well combined. In another bowl, combine the flour, ground almonds, baking powder, baking soda, cinnamon, and salt. Add the flour mixture to the wet ingredients and mix until just combined. Divide the batter between the muffin cups, fill each about 3/4 full, and bake for about 20 minutes or until a skewer comes out clean. Cool in the muffin pan several minutes then transfer to a wire rack and cool completely. 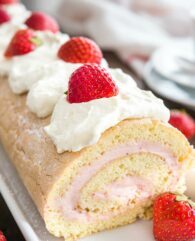 To make the frosting, beat together softened butter and powdered sugar in the bowl of a stand mixer fitted with the paddle attachment at medium speed until light and fluffy, about 2-3 minutes. Add vanilla extract and cream cheese and beat until blended. Frost cupcakes with cream cheese frosting. These look so darn good. I’m such a sucker for a good carrot cake treat. I think I’m more obsessed with the icing than the actual cake! Thanks for sharing this. Love your photography! Hey there! Can’t wait to try these! This is the first carrot cake recipe I’ve found that uses butter instead of oil ❤️ What could I use if I don’t have ground almonds? Thanks! Hi Natalie, you can use any other ground nuts like hazelnuts or pecans instead of the ground almonds or grind any whole nuts in a food processor :-) Happy Easter!